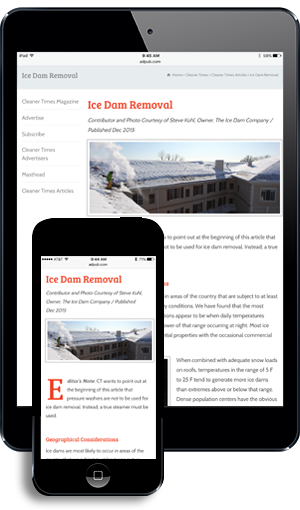 Editor’s Note: This entry includes some information from the 2002 Power Washer’s Guidebook article, “Heavy Equipment Cleaning,” which was written by Dave Ottmer, Action Mobile Wash, Brenham, TX. Track machines—bulldozers, loaders, and backhoes—and rubber-tired machines—loaders, off-road haulers, and graders—come in many forms and serve industries ranging from construction and demolition to pipeline work and timber harvesting. 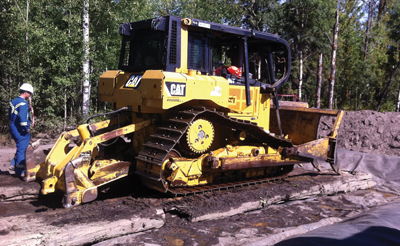 Mud, debris, grease, and diesel residue make all machines candidates for cleaning. The first step in pressure washing is safety. All necessary paperwork and a safety meeting must be completed before any work commences. Know the rules for working around off-road/construction equipment, including right-of-way and requirements for PPE (personal protective equipment). When a contractor goes on site to wash equipment, the equipment owner will usually have a wash pit set up. If a pit is not set up, it must be created by laying a large tarp (edges up) that will be suitable for collecting and containing all debris that will be released from the off-road machine. Wastewater containment is a must to meet environmental requirements governing most places—and to be environmentally friendly everywhere. When washing rubber-tired machines, the tarp alone will be fine. For track machines, however, it is best to put a swamp mat on the tarp for the machine to drive on. The mat prevents the machine from ruining or tearing up the containment tarp. Goals differ with location. For example, in central Alberta, clubroot, a plasmodium organism, is a serious threat to canola and crucifers of many sorts. Clubroot can be spread via the undercarriages of heavy equipment, so sanitation tied to agriculture—and beyond agricultural equipment—requires cleaning the undercarriages to prevent clubroot from being carried from one place to another. I always start washing with the undercarriage, which will be the dirtiest. To start with the body when the undercarriage is dirty means that a rewash of the body will be required after the undercarriage is done. After washing off all the heavy mud and grease, apply soap and degreaser to get to the final state of cleanliness. Make sure to pay special attention to the radiator, if the foreman has mentioned the machine has been overheating. In cleaning the radiator, do not be afraid to saturate it with degreaser and to spend at least 20 minutes on the radiator going slowly back and forth, spraying straight on with a wide spray tip, for this is the heart of the machine. If the radiator is plugged, the machine will overheat and will not be able to operate. Caution: Be careful not to bend the fins. Once the machine has been washed, my company likes to take it one step further. We bleach the undercarriage to kill any clubroot that could be on the machine. This will stop the spread of clubroot. Large amounts of lubricating grease can be removed manually—latex disposal gloves work—before applying a degreaser. Doing so reduces the chance of inadvertently spreading some of the grease to other parts of the machine when washing. Similarly, crusty or dried diesel can be removed by brushing in some degreaser, rinsing, and repeating. The minimum requirement is a machine with a boiler that is capable of 4000 psi at four gpm. 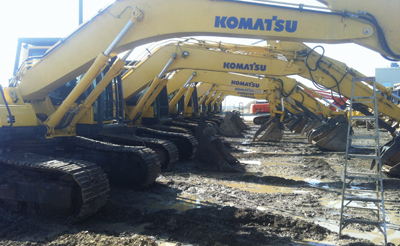 Rate of flow is the crucial factor in washing heavy equipment. A 1000-gal water tank is another minimum requirement. My company’s pressure washing trucks can wash for seven hours straight. Other equipment includes a step ladder (never stand on tires or tracks when cleaning), degreaser, truck brush, latex gloves, and chemicals and sprayer, depending on the job. I recommend billing by the hour because every piece of equipment is different. 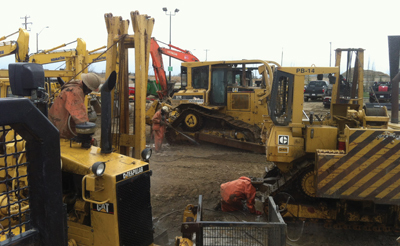 It takes three to five hours to wash an excavator, but some companies only wash their equipment when it breaks down. Consequently, there could be grease and mud build up on some machines. And, it takes longer to wash in winter—often, twice as long due to cooler temperatures. Contractors will have to develop a method for pricing, whether hourly or per machine, that incorporates all their cost centers, which include: size of machine to be cleaned, level of cleaning to be performed (simple wash to mechanic’s wash), hauling (fuel cost, tank truck maintenance), wastewater containment and disposal, and degree of filth. By assessing the machine before starting, the contractor can plan the best approach and also establish an appropriate price. Setting a fixed price list by type of equipment will work if it serves as the basic price with add-ons. Add on a containment service. A disposal service is also a good add-on for companies with vacuum trucks. I see a lot of guys that buy trailer units that only carry 300–400 gal of water, which means they can only wash for a couple hours before refilling. Remember, most of the time, the site for washing is in the middle of nowhere and refilling can take an hour or longer. So, if a contractor can only wash for a couple of hours and then has to refill a water tank, the probability is high the contractor will soon be replaced by a company that can get more washing done in a unit of time. Start on the dirtiest part of the machine to avoid mistakes and save time. John Bourbeau is the CEO of Champs Pressure Washing & Steaming Ltd., a company that started operations in May of 2011 with one truck and a dream. Three years later, the company has five employees, four steam trucks, one Hydro-Vac, and it is moving into mobile sandblasting.